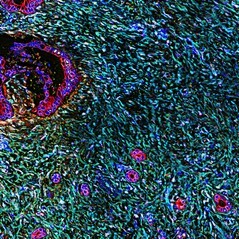 As shown here, pancreatic cancer is associated with a vast desmoplastic reaction in which the connective tissue around the tumor thickens and scars. Tests similar to the one depicted here help distinguish between "good" and "bad" stromal reactions. Researchers hope this could allow the design of therapies that will reprogram tumor-stromal interaction. Cancerous cells are in red; nuclei are in blue; stroma/desmoplasia is in cyan; and stroma-specific markers are in yellow and green while marker overlays appear white.